KIC 8462852, informally known as Tabby’s Star, is a magnitude +11.7 F-type main-sequence star located in the constellation Cygnus approximately 1,480 light-years from Earth. 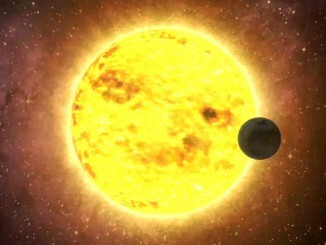 Data from NASA’s Kepler space telescope shows that the star displays aperiodic dimming of 20 percent and more. 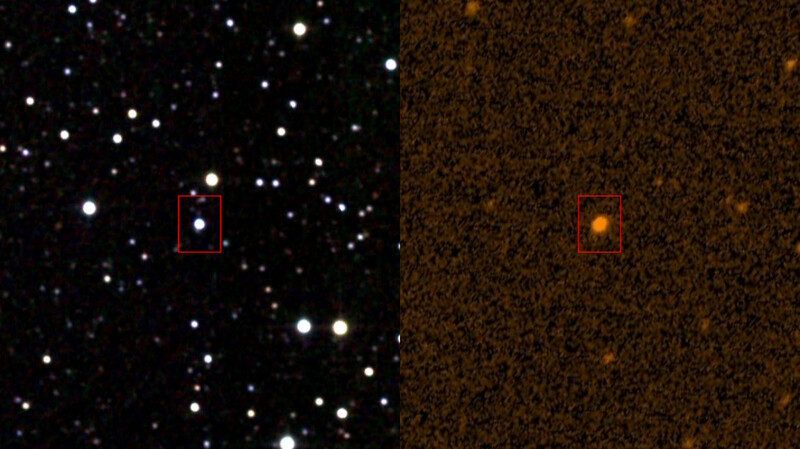 KIC 8462852 is shown here in infrared (2MASS survey, left) and ultraviolet (GALEX). Image credit: IPAC/NASA (infrared); STScI/NASA (ultraviolet). Could there be intelligent life in the star system KIC 8462852? A recent analysis of data collected by NASA’s Kepler space telescope has shown that this star, informally known as Tabby’s Star (after American astronomer Tabetha Suzanne Boyajian), evidences aperiodic dimming of 20 percent and more. While several natural explanations for this strong change in luminosity have been proposed, one possibility is that a technologically adept civilisation has built megastructures in orbit around the star, causing the dimming. The Allen Telescope Array (ATA) is a “Large Number of Small Dishes” (LNSD) array designed to be highly effective for simultaneous surveys undertaken for SETI projects (Search for Extraterrestrial Intelligence) at centimetre wavelengths. Image credit: Seth Shostak, SETI Institute. In order to investigate the possibility of a deliberate cause of KIC 8462852’s unusual behaviour, the SETI Institute has trained its Allen Telescope Array on this star for more than two weeks. The array consists of 42 antennas, each 6 metres in size, and is located approximately 500 kilometres north of San Francisco in the Cascade Mountains. Two different types of radio signals were sought: (1) Narrow-band signals, of order 1 Hz in width, such as would be generated as a “hailing signal” for societies wishing to announce their presence. This is the type of signal most frequently looked for by radio SETI experiments. (2) Broad-band signals that might be due to beamed propulsion within this star system. If astroengineering projects are really under way in the vicinity of KIC 8462852, one might reasonably expect the presence of spacecraft to service this activity. If these craft are propelled by intense microwave beams, some of that energy might manifest itself as broadband radio leakage. 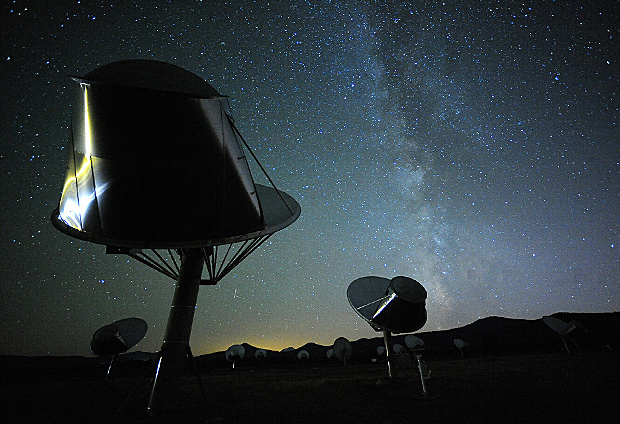 “This is the first time we’ve used the Allen Telescope Array to look for relatively wideband signals, a type of emission that is generally not considered in SETI searches,” said SETI Institute scientist Gerry Harp. Analysis of the array data show no clear evidence for either type of signal between the frequencies of 1 and 10 GHz. This rules out omnidirectional transmitters of approximately 100 times today’s total terrestrial energy usage in the case of the narrowband signals, and 10 million times that usage for broadband emissions. 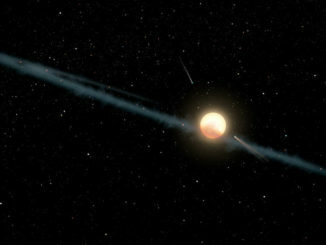 While these limits are relatively high — a fact due primarily to the large distance (>1,400 light-years) of KIC 8462852 — one should note the following: (1) The required transmitter power for the narrowband signals could be reduced enormously if the signal is being deliberately beamed in our direction. (2) Microwave propulsion schemes would undoubtedly be beamed as well, and that would also reduce the minimum transmitter power necessary for detection by the array. One method to discover planets beyond the solar system by far is transit photometry, which measures changes in a star’s brightness when a planet crosses in front of its star along our line of sight. NASA’s Kepler Space Telescope has used this technique to become the most successful planet-hunting spacecraft to date, with more than a thousand established discoveries. Satellites carrying improved technology for all-sky surveys are now planned, missions that will tell us a great deal about alien planetary systems similar to our own. 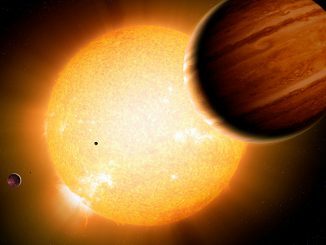 After analysing four years of observations from NASA’s Kepler space telescope, astronomers from the University of Toronto have given us our clearest understanding yet of a class of exoplanets called “warm Jupiters,” showing that many have unexpected planetary companions.